Size (Right): Small: 13" -14" Size (Right): XLarge: 18" - 19" Size (Left): XLarge: 18" - 19" Size (Left): XSmall: 12" - 13" Size (Right): Large: 16" - 18" Size (Left): Large: 16" - 18" Size (Left): Medium: 14" - 16" Size (Left): Small: 13" - 14" Size (Right): Medium: 14" - 16"
The Cho-Pat Patellar Stabilizer improves patella tracking, resulting in less degeneration, inflammation and pain. It functions dynamically because the fabric-covered neoprene material applies constant pressure to the joint providing effective symptomatic relief of acute and chronic pain associated with patellar tendonitis, arthritis, and overuse syndromes. In addition, the Stabilizer has four enclosed firm plastic tubes acting as buttresses around the kneecap to reduce patellar subluxation and degeneration. The Patellar Stabilizer allows for full mobility of the knee joint while improving lateral and medial support for weak and arthritic knees. 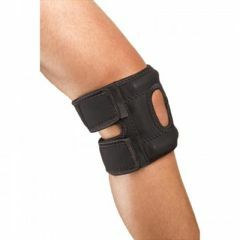 While the original Cho-pat Knee Strap is recommended first for kneecap pain, the Patellar Kneecap Stabilizer is recommended for hyper-mobile kneecaps. Made in the U.S. of quality materials. CP43 - Size (Right): Small: 13" -14"
CP49 - Size (Right): XLarge: 18" - 19"
CP48 - Size (Left): XLarge: 18" - 19"
CP40 - Size (Left): XSmall: 12" - 13"
CP47 - Size (Right): Large: 16" - 18"
CP46 - Size (Left): Large: 16" - 18"
CP44 - Size (Left): Medium: 14" - 16"
CP42 - Size (Left): Small: 13" - 14"
CP45 - Size (Right): Medium: 14" - 16"
Easy To Use. Painless. Reliable. Compact. Because of displaced kneecaps, wearing the stabilizers is a must. I am training for the Avon 26 mile walk and I don't know what I would do without the stabilizer. Adults. Daily Use. Use when running/walking. Protects sore knees. How do I know what the best option is for a patella brace? Strap in back, front or none at all? I wont to do knee exercises and jog/run. Thank you. Where do I measure -- above the knee or below the knee???? I measured in the center of the knee cap and my brace fit great. What am I measuring on myself for this particular brace?